If you’re been researching your family history for some time, chances are you have started “climbing down” your family tree. Your great-grandfather no doubt had a few sisters. Have you tried branching out to find them? It can be difficult finding female family members since they often married after leaving the home. If you don’t know who they married, quite often you stare straight into a roadblock and move along in your research. The time has come to knock some of those roadblocks down! I’d like to share with you a few quick tips on locating females in your family research when you don’t know their married names. This will take some time, but it can have wonderful results. This exhaustive search method assumes you know the approximate area (county, township) where she lived at some point, but you don’t know who she married. Have you searched for her marriage record? Make sure to look through vital records in addition to searching local newspapers. Did you look through all the obituaries for her known family members to see if she is listed by married name? Many times the obituary will list “Mrs. Gallagher” as a sister and that can be your very best lead. Did you already check for a death record by searching for her father’s name? Did you look for birth records in the county or state of her known residence for possible children that might list her maiden name on their birth certificate? Have you searched through city directories to find her nearby where here parents lived? Have you already performed census searches for her under her maiden name? Many young women moved out and into a home nearby as a servant. This might also be a lead, since sometimes young women married a son of the family she served, or a neighbor. Did you try searching for her on FindAGrave.com? Find the cemetery that other members of her family are buried in, then search that cemetery’s interment records for her first name and/or year of birth. If you didn’t have any luck with those methods, then you’ve got a true roadblock on your hands. With all of that searching behind you, it’s seriously time to tackle it! Note: This search method is very time consuming but if you are serious about finding her, it’s worth a shot. It has worked for me a few times already. Make a list of all US Census entries you already have for her. You will need to know the state, city, township and any further location information that tells you where she lived in the previous census. Estimate the birth year as best you can based on all available information. If a girl is listed in the 1910 US Census and her age is 7, she was likely born in 1902 or 1903. If it was enumerated on April 10, 1910 then she was born before April 10, 1903 which means statistically she has a higher probability of being born in 1902. There were 8 months of 1902 (between April and December) and only 4 months of 1903 (January through April) that are potential birth dates for her. You must consider this when searching by age for anyone in the census. Armed with her first name (with any nicknames), along with the county which she previously resided and her estimated year of birth, start searching the US Census records. Select the US Census after the last one you know she was in. If you’ve found her with her family in 1910, then start your search in the 1920 Census. 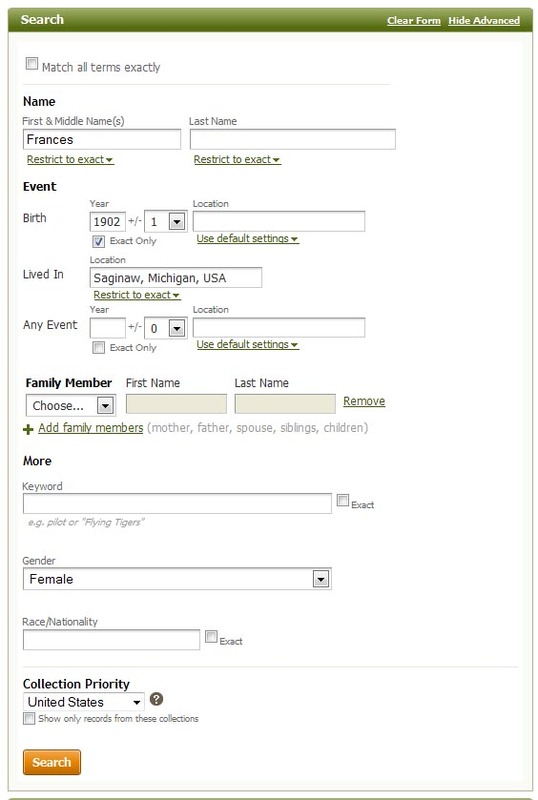 Enter her First Name, Birth Year +/- 1, Birth Location, last known Residence information and her Gender. I suggest starting with an “Exact Match” search and widening it if you don’t find what you’re looking for. Click on search and see what comes up. This search assumes she hasn’t moved too far away after moving out of the house. Once you exhaust the results from the county she was from, you can widen the search to the state and country if necessary. Here’s where your search gets tricky. Every result is a potential lead. You have to research each one of them in turn, individually. What you’re looking for is the low hanging fruit that you can discard quickly. Make a list of every lead in the search results, and try to disprove each one by finding out as much as you can about the woman listed. You might have just a few or there might be several dozen. You’ve got to assume each one could be her, and rule them out one at a time. For each female, run her married name through all of the common websites you search frequently for genealogical information. Look her up on FindAGrave.com and at FamilySearch.org to see if any familiar surnames are unearthed. 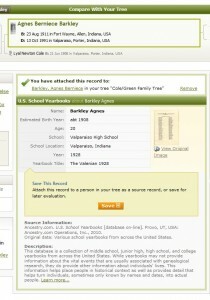 Search for her on Ancestry.com to see if someone else has a family tree with the lead listed. See if you can find her obituary for listings of family members. Think of this as “innocent until proven guilty” scenario. Assume that each lead could be her, until you prove otherwise. 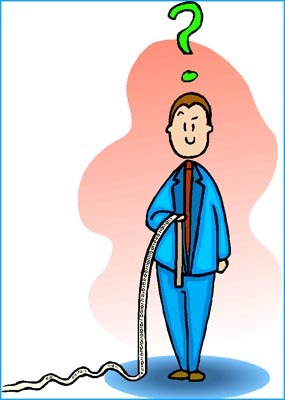 A majority of your leads will get thrown out within a few minutes. You will likely find enough information about each one that you can comfortably assume that she is not part of your family. Once you weed out all the obvious mismatches, you will be left with a few that are real possibilities. It might take some time, but hopefully out of all the leads you research, you will find her! She might have died before the Census you are searching was enumerated. She might have moved out of the county or state before or after getting married. You might need to broaden your search to other states, and sometimes to other countries. She might be indexed incorrectly in the census, or may not have been indexed at all. Try another census year if possible. I wish you the very best of luck in your searching. If you have any tips to share, please leave a comment below! Please visit my personal genealogy blog, Random Mews. 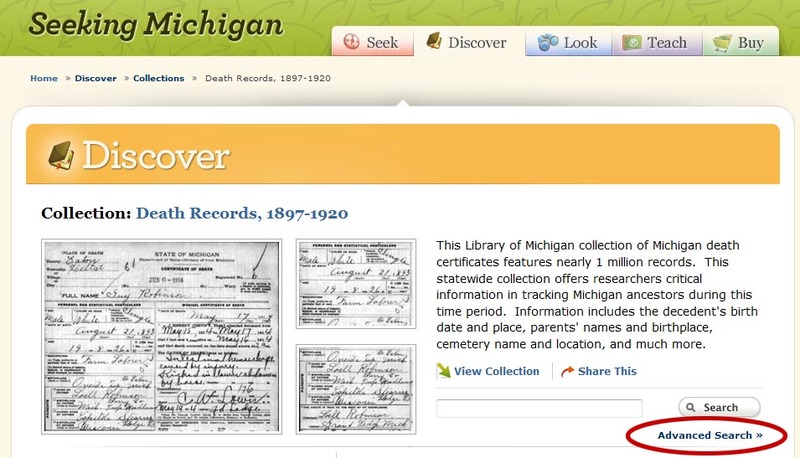 If you have ancestors in Michigan, changes are you have searched through all of the wonderful records of SeekingMichigan.org. The site has some incredible resources for Michigan researchers. Death records, civil war records including manuscripts and photographs, historical documents, maps and more are just the tip of the iceberg for this genealogical treasure trove. 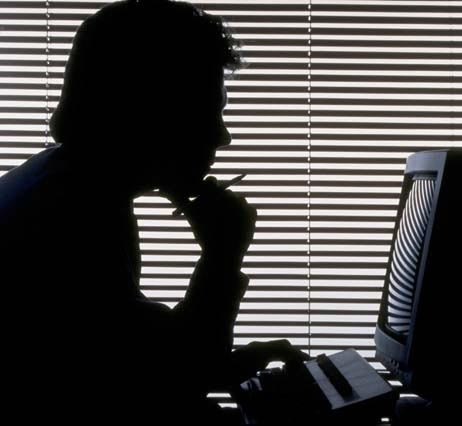 Did you know you can search death records by the name of the deceased person’s father? This is helpful when you are trying to locate daughters in your family who were married and changed their last names prior to their death. It is also an excellent search method when you want to find children who died very young and may not have been listed on a Census record. 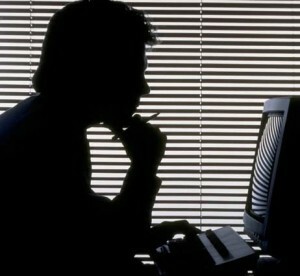 You might be asking yourself, how do I search by a person’s father? It’s simple, really! You just have to dig a little. 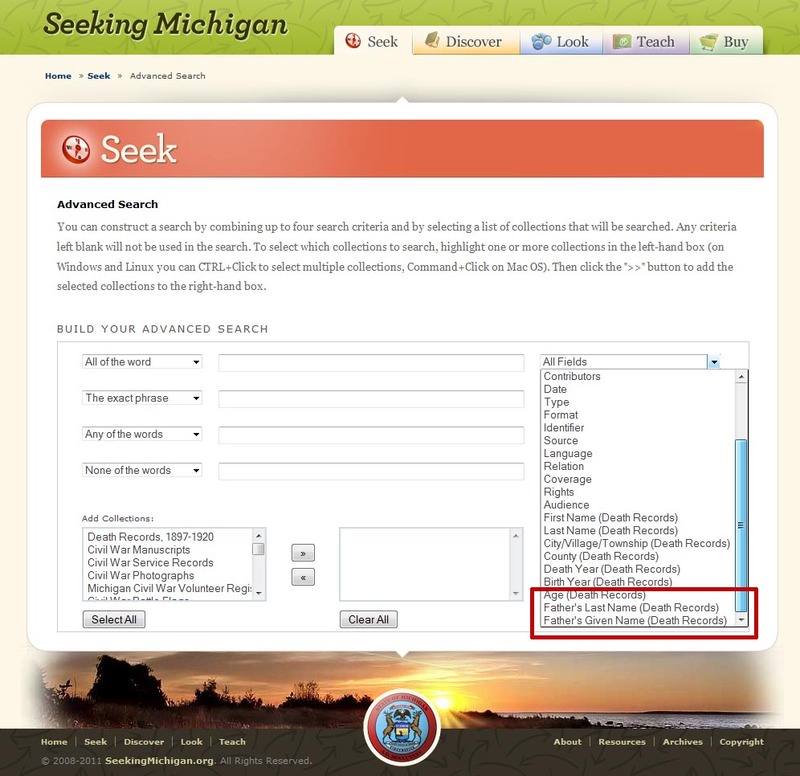 Go to the Seeking Michigan website. Click on the Discover link. Click on the Death Records, 1897-1920 link. Select the drop down menu for All Fields on the right, and choose a helpful search field. You can further narrow your search by adding more fields and searching them in various combinations. Good luck in your search! If you have any tips to share, please leave a comment below. I’d love to hear how you have been successful in your alternative searching methods. I was fortunate enough to visit the Genealogy Center at the Allen County Public Library in Fort Wayne, Indiana in July 2011. I had three glorious days to research as much as possible. All of that research amounted to a massive pile of photocopies from various branches in my family; 259 pages to be exact! That’s a lot of paperwork. I knew once I got it home, it would be really difficult for me to scan it all in with my little home all-in-one machine. I was also worried about checking it in at the airport; who knows if I would ever see it again? Lucky for me (and you) there is a little copy shop called OfficeOne around the corner from the Allen County Public Library that has a high speed scanner. Simply feed in your stacks of copies (I sorted mine by Surname) and they will scan directly onto your USB thumb drive. I had one PDF file created from each stack and named to correspond to the surname, but you can choose to scan each page as a JPG individually. Sure it costs money, but what is your time worth? I made 259 copies at the library at 10 cents each, and promptly had them scanned in at OfficeOne for 10 cents each. I can say without a doubt that my time is worth way more than $25.90, especially when it equates to immediate digital access to share my research with my family around the country. I was able to email the PDFs to my family members from my tablet while I was waiting at the airport. If you’re looking for a place to scan in all of your ACPL research before you get back in the car or head off to the airport, check out this copy shop. The staff was friendly, their equipment was new and I felt very comfortable working with them. They were able to scan everything in while I waited, and showed me how it all looked, verifying all the files on my thumb drive before I walked out the door. I have spent many moons scanning and cataloging images for my family archive. It contains more than 6,000 images which were all painstakingly dated and fully detailed and tagged with descriptions and locations to the best of my ability. Documents can be fairly straight forward since many of them contain a date written upon them. Photographs, however, are often much trickier. My Mom did an excellent job throughout the years of writing the exact date on the back of our family photos. I thank her so much for that – it makes sorting and organizing the photos much easier today. She often wrote the exact date and day of the week on the back of the pictures, which is amazing. My DaD on the other hand… he didn’t often write dates on things. (Sorry DaD, it’s true.) To his credit, he has tried to go back and write dates on photos decades later, but I have learned to take those dates as a starting point. 🙂 I recently came across a photo that has his handwriting on the back: “Diane and Carol, 1977?” just above the ink stamp from the developer that shows “June 1980” as the film date… Thankfully he is getting much better at dating old photographs and has recently helped me to identify many pictures correctly. Yay DaD! I often get asked how I date photos, especially when I have no worldly clue when the photo was taken. There are many books on the subject, including several that target specific time periods and help you identify dates based on clothing, backgrounds, style of portraiture, wardrobe and more. They can be a priceless resource when trying to identify an ancestor’s photo from the earlier parts of the 20th century. This photo was taken in the living room of the house I grew up in. I know this because of the curtains behind her. 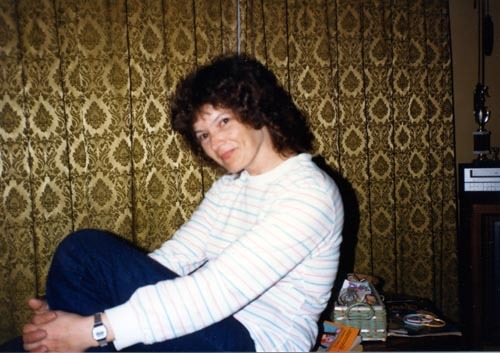 Since I know my mother moved out of our house in August 1987, I can safely assume this photo was taken before then. I know she won the VCR that you can see behind her on top of the television in a radio contest sometime in 1985, so I know it wasn’t 1984 or before. There’s also a bowling trophy on the TV which I believe she won in 1985 around the same time as the VCR, so that helps confirm the early side of the date spectrum. If you look very closely at the items on the table behind her, you can see what appears to be a sewing kit and a magazine which doesn’t really help me much. 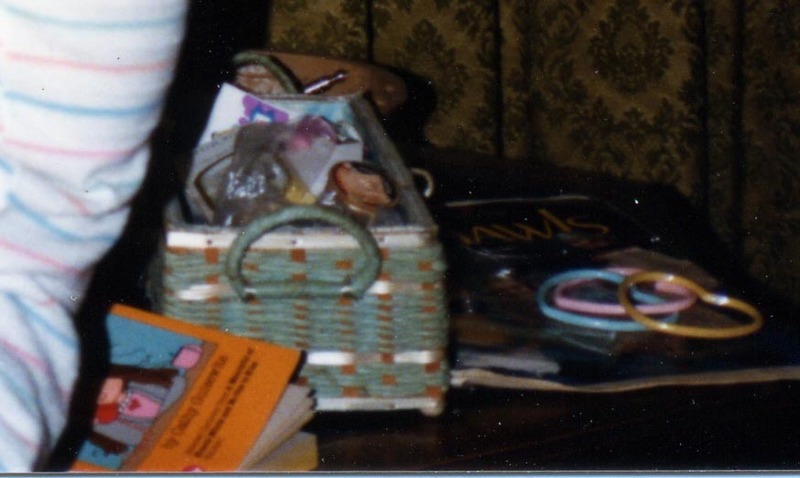 On top of the magazine are three heart dangle bracelets, which was a very popular thing for my sister to be wearing in 8th grade which would have been 1985-1986 for her. This helps confirm my initial thoughts on time frame. Then I realized the book Mom is sitting on is a comic book of the popular strip Cathy. I inherited it from my sister as a hand-me-down a few years later and read it many times. A little Google search for “cathy comic” led me to Wikipedia’s list of all the Cathy comic books published. Using Google Images, I typed in each of the book titles that were published in the mid-1980’s until I found a book cover that matched the one in the photo: “Sorry I’m Late, My Hair Won’t Start” by Cathy Guisewite. I know my sister received the comic book as a gift. It must have been received for Christmas 1985 or for her birthday in June 1986. Based on my mother’s choice of long sleeve shirt and jeans, I have to imagine it would have been cold in Michigan when this photo was taken. Based on all of those details, I believe this photo was taken during the first few months of 1986 – after Christmas and before it warmed up in the Spring. This is a simple example of the types of details I look for in photos to help date them. Does it matter whether it was taken in January or February or March in 1986? Not terribly in this case. I am satisfied with “Early 1986” as the date for this one. In the case of your photo, these extra-sensory detective skills might just make all the difference in the world. I wish you the best of luck in researching and dating your family photographs! Ancestry.com recently added a significant amount of content to their online collection of U. S. School Yearbooks. I have been able to locate several of my family members throughout the country, but it hasn’t exactly been easy. Of course, it goes without saying that if you really want to find someone you need to dig deep from every angle. Here are some tips to help you learn from my trials and errors. Eliminate the first name. I have found that the OCR scanning they used to index the yearbooks is less than optimal. Many times, my family members are pictured but not listed in the index. Many of them have been listed with last names only (i.e. “COLE”) or first initial and last name (i.e. “R. FITZGERALD”). Reverse your search. Look for the last name in the first name, and first name in the last name field. For example, I was looking for my great-grandmother “Agnes Berniece Barkley” but in order to find her, I had to search for “Barkley Agnes” in the index. In the same yearbook twenty pages later, I found her indexed correctly as “Agnes Barkley” singing as part of the Glee Club! Make sure you are searching all over the book in case your target person is listed multiple times. Ignore the dates listed for approximate age. Since there are no birth dates or years provided, Ancestry.com has chosen to give the same exact birth year for every student in the entire yearbook. I suggest an index search range of 9-22 years after your ancestor was born for High School yearbooks, and 13-26 years for College yearbooks. In the example provided here, Agnes Barkley’s approximate age is 20 with an approximate birth year of 1908. She was actually 16 or 17 and was born in 1911. Take the index birth year with a giant chunk of salt. Locate another photo to help with the group portrait hunts. To find your great-grandmother in a giant group portrait can be difficult. A lot of the students look alike. Try searching the rest of the yearbook first to see if there is an individual photograph of her to get an idea of exactly what she looked like. You might also reference family pictures from the same era for a good place to start. Eliminate as many people as you can and narrow down your scope for large group photos. Send a copy of it to relatives in email (or *gasp* send a printout in an actual envelope) and ask for their assistance in locating her in the group shot. Don’t forget to somehow document where she is once you locate her. 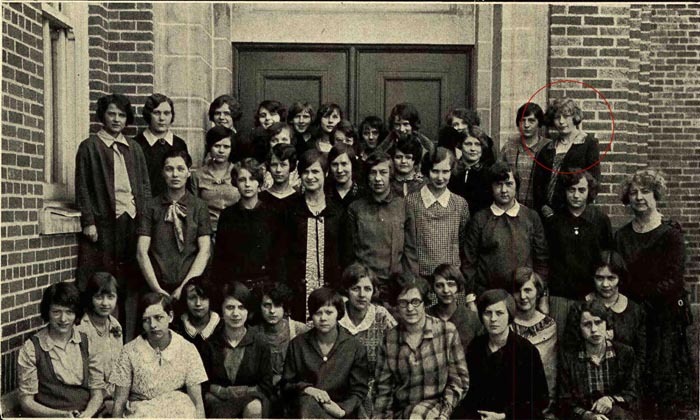 You could store a second copy of the image noting the location in a bright or obvious fashion (like the red circle above) or by cropping her out in a smaller JPG version stored with the original file to make it obvious to the next person generation which student she is. Search all yearbooks in adjacent years. If you’ve found your grandfather in 1934, check out the yearbooks for 1933 and 1935 even if he’s not showing up in the index. He might be indexed incorrectly or might have used an initial instead of a full name. If you know he was a Sophomore in 1934, look under the Freshman class in 1933 and the Junior class in 1935. If you’re lucky, he’ll be listed as a Senior in 1936. Don’t cut corners. I suggest you be patient and thumb through the images just like you would look through a real yearbook in your hands. You might miss an amazing photo treasure that wasn’t indexed. You might also find other relatives such as cousins, siblings or spouses that you didn’t even know you were looking for. Don’t give up! 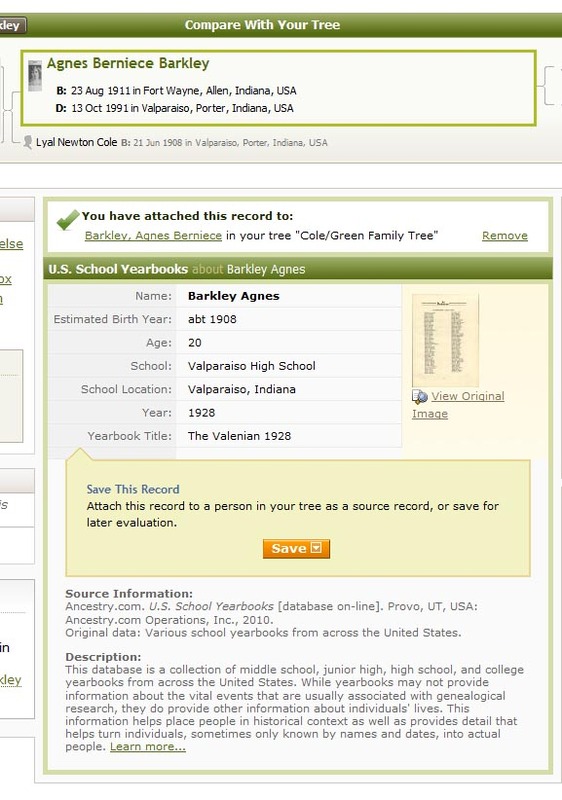 If your ancestor is not showing up in the search, use the Browse This Collection area (on the right side) to see if there are yearbooks online for the targeted location and general time frame. If you have any additional tips, I’d love for you to leave a comment below. Good luck finding your family in this wonderful collection! PS: I still can’t believe my great-grandmother was in the Glee Club! That’s awesome. Have you given much thought about how to preserve the social media you use every day? There’s no telling how the stuff we put online today will be made available, if ever, to our descendents. While the National Archives is grabbing all of our public tweets, if yours aren’t public they may be lost to time. One of the things I have started to do is capture screen shots of Facebook profiles of my family members, myself included. This is especially neat to do on unique occasions such as someone’s birthday, prom, Christmas, graduation, etc. I simply take a screen shot and paste it into Photoshop and save the file as a JPG. 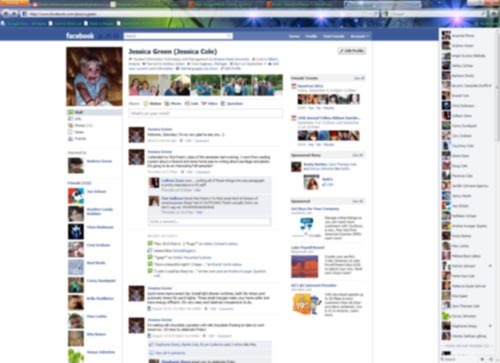 I name the file with the date and a description, such as 20110830_FacebookProfile_JessicaGreen.jpg. I’d love to hear your tips on how to capture today’s technology for tomorrow’s genealogists. What do you suggest?